Pine chemicals is a family of renewable, naturally occurring materials derived from the pine tree (genus Pinus). These chemicals are derived through the distillation of oleoresin or carbonization of wood. A majority of distilled products are made from gum, stumps, logs, and sulfate pulp byproducts. During the papermaking process, chemicals from pine tree are recovered as co-products of the pulping process in the form of crude tall oil (CTO) and crude sulfate turpentine (CST). Oleoresin can also be recovered from pine trees. It is separated into gum rosin (GR) and gum turpentine (GT). Based on type, the global pine-derived chemicals market has been segmented into tall oil fatty acids, tall oil rosin, gum turpentine, gum rosin, pitch, sterols, and others. The gum rosin segment held a leading share of the global market, in terms of both value and volume, in 2017. The segment is estimated to expand at a considerable pace during the forecast period. Gum rosin is used in printing inks, photocopying and laser printing paper, varnishes, adhesives, soap, soda, soldering fluxes, and sealing wax as well as in paper sizing. Tall oil rosin (TOR) is another significant segment of the global pine-derived chemicals market. It is estimated to expand at a rapid pace during the forecast period. TORs are unmodified in order to provide a cost-effective and flexible starting point for several end-use applications and customer-specific processes. Tall oil fatty acids is another significant segment of the market. These acids are used in the manufacture of dimer acids, alkyd resins, oilfield chemicals, metalworking fluids, liquid cleaners, textile chemicals, fuel additives, construction chemicals, metallic stabilizers, and fatty derivatives. Gum turpentine and gum rosin segments are projected to expand at a significant growth rate during the forecast period. The sterols segment held a relatively minor share of the global market in 2017. In terms of application, the global pine-derived chemicals market has been divided into paints & coatings, adhesives & sealants, surfactants, and printing inks. The paints & coatings segment accounted for a dominant share of the global market, in terms of both revenue and volume, in 2017. Use of paints and coatings makes products more durable, more attractive, safer, and more saleable. The adhesives & sealants segment constituted a significant share of the global pine-derived chemicals market in 2017. The segment is estimated to expand rapidly during the forecast period. Adhesives and sealants function along with other components of the assembly to provide a durable product. The surfactant segment held a key share of the global pine-derived chemicals market in 2017. It is anticipated to expand at a considerable pace throughout the forecast period. Printing inks and surfactants segments constituted low shares of the market. They are expected to expand at a sluggish pace during the forecast period. Based on region, the global pine-derived chemicals market has been classified into North America, Europe, Asia Pacific, Middle East & Africa, and Latin America. In terms of both value and volume, Asia Pacific was a leading region of the global pine-derived chemicals market in 2017. The region is estimated to continue its dominance throughout the forecast period. The market in the region is anticipated to expand at a rapid pace during the forecast period, due to increase in urbanization, growth in the disposable income of consumers, and advancements in technology. In terms of consumption, Europe and North America follow Asia Pacific. The market in Europe and North America is expected to expand at a significant pace from 2018 to 2026, owing to easy availability of pine trees in these regions. In terms of demand, Latin America and Middle East & Africa constituted relatively low shares of the global market in 2017. However, the market in Latin America is estimated to expand at a substantial pace during the forecast period, led by wide availability of pine trees in the region. Based on type, the global pine derived chemicals market has been segmented into tall oil fatty acids, tall oil rosin, gum turpentine, gum rosin, pitch, sterols, and others. The gum rosin segment held a leading share of the global market, in terms of both value and volume, in 2017. The segment is estimated to expand at a considerable pace during the forecast period. Gum rosin is used in printing inks, photocopying and laser printing paper, varnishes, adhesives, soap, soda, soldering fluxes, and sealing wax as well as in paper sizing. Tall oil rosin (TOR) is another significant segment of the global pine-derived chemicals market. It is estimated to expand at a rapid pace during the forecast period. TORs are unmodified in order to provide a cost-effective and flexible starting point for several end-use applications and customer-specific processes. Tall oil fatty acids is another significant segment of the market. These acids are used in the manufacture of dimer acids, alkyd resins, oilfield chemicals, metalworking fluids, liquid cleaners, textile chemicals, fuel additives, construction chemicals, metallic stabilizers, and fatty derivatives. Gum turpentine and gum rosin segments are projected to expand at a significant growth rate during the forecast period. The sterols segment held a relatively minor share of the global market in 2017. In terms of application, the global pine-derived chemicals market has been divided into paints & coatings, adhesives & sealants, surfactants, and printing inks. The paints & coatings segment accounted for a major share of the global market, in terms of both revenue and volume, in 2017. Use of paints and coatings makes products more durable, more attractive, safer, and more saleable. The adhesives & sealants segment constituted a significant share of the global pine-derived chemicals market in 2017. The segment is estimated to expand rapidly during the forecast period. Adhesives and sealants function along with other components of the assembly to provide a durable product. The others segment held a key share of the global pine-derived chemicals market in 2017. It is anticipated to expand at a considerable pace throughout the forecast period. Rubber is composed of different ingredients including the base monomer, vulcanization agents, modifiers, fillers, and plasticizers. Printing inks and surfactants segments constituted low shares of the market. They are expected to expand at a sluggish pace during the forecast period. The report analyzes and forecasts the pine-derived chemicals market at the global and regional levels. The market has been projected in terms of volume (kilo tons) and value (US$ Mn) from 2018 to 2026. The study includes drivers and restraints of the global market. It also covers the expected impact of these drivers and restraints on the demand for pine-derived chemicals during the forecast period. The report also highlights growth opportunities for the market at the global and regional levels. The report comprises detailed value chain analysis, which provides a comprehensive view of the global pine-derived chemicals market. Porter’s five forces model has also been included to help understand the competition landscape of the pine-derived chemicals market. The study encompasses market attractiveness analysis, wherein type and application segments have been benchmarked based on their market size, growth rate, and general attractiveness. 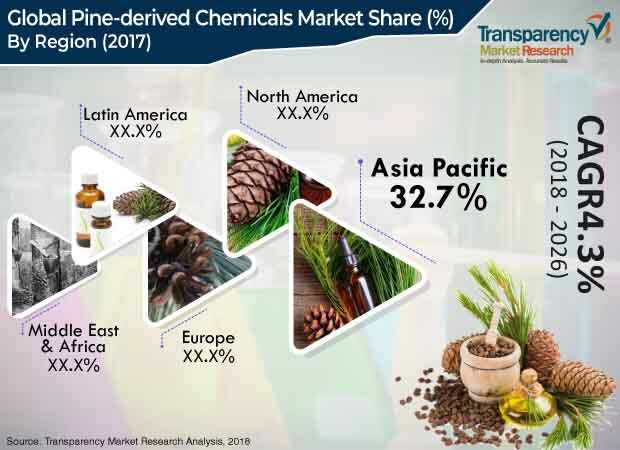 The study provides a decisive view of the global pine-derived chemicals market by segmenting it in terms of type, application, and region. These segments have been analyzed based on the present and future trends. Regional segmentation includes the current and future demand for pine-derived chemicals in North America, Europe, Asia Pacific, Latin America, and Middle East & Africa. The report also covers individual type and application segments of the market in every region. The study includes profiles of major companies operating in the global pine-derived chemicals market. The market is dominated by large players. Key players operating in the global market are Eastman Chemical Company, Harima Chemicals Group, Inc., Arakawa Chemical Industries, Ltd., Kraton Corporation, and Forchem Oyj. Market players have been profiled in terms of company overview, business strategies, and recent developments. The report provides size (in terms of value and volume) of the global pine-derived chemicals market for the base year 2017 and forecast for the period from 2018 to 2026. Market numbers have been estimated based on type, application, and regional segments. The market size and forecast for each type and application segment have been provided for the global and regional markets.